Hopi Hari is one of the largest amusement parks in Brazil, and one that has been on my personal bucket list for many years thanks to it having the only wood roller coaster in South America. 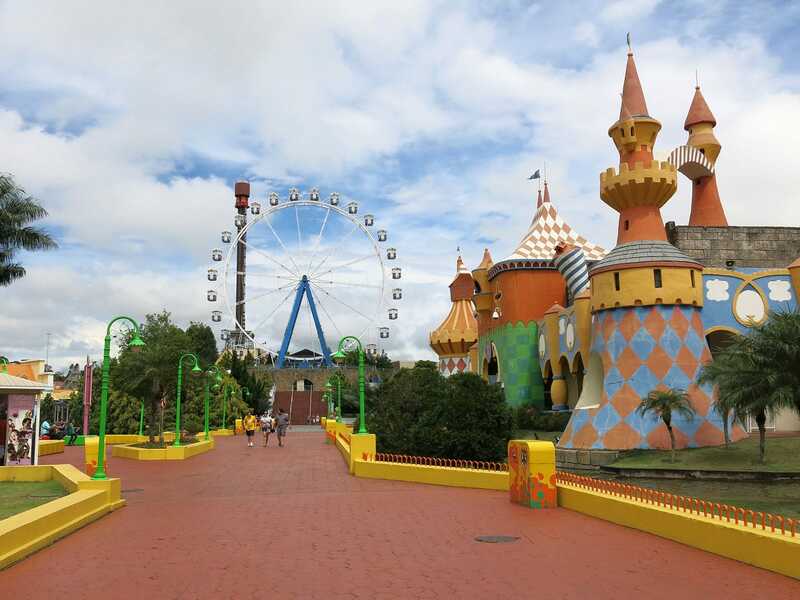 First impressions were very positive, with bright colours and attractive theming everywhere in sight. Unfortunately, we'd been there less than five minutes before the cracks in the facade began to appear. 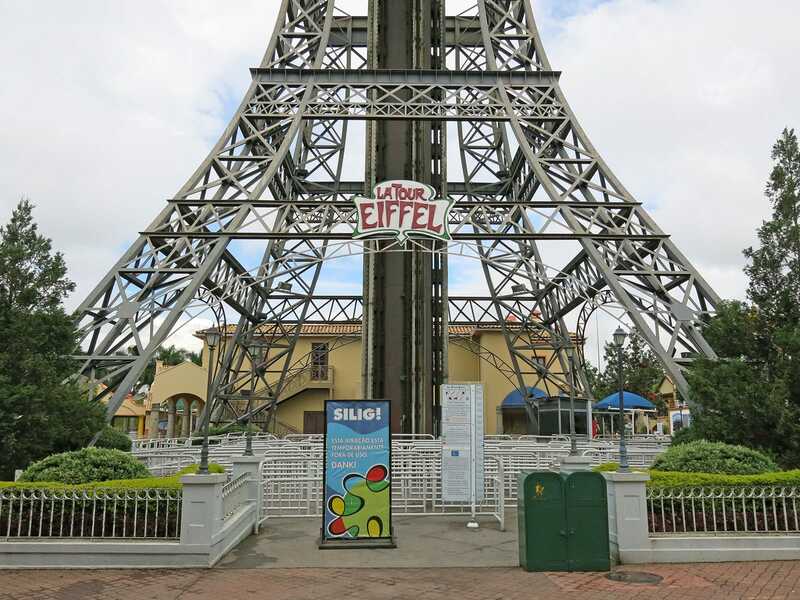 The first major ride inside the front gate is La Tour Eiffel, an Intamin drop ride that suffered a fatal accident in February 2012 when a fourteen year old girl fell out of the ride. Local media published a video at the time which left little doubt as to what happened, as it showed an overhead restraint flying into the air while the ride car dropped to the ground. In a particularly fine example of enthusiast camaraderie, we received a text message from Talhat advising us that we should ride in order to get very close to God, but it wasn't to be; the tower was closed. Other attractions em manutençao today included the Giranda Mundi, Chabum, Tokaia, Crazy Wagon, Splesh, and the Vurang roller coaster. We did see the latter cycling empty trains at one stage, but it never actually opened. Many of the remaining rides and attractions were operating on a limited schedule. The only coaster operating when we arrived, an hour after opening, was the powered Bat Hatari. It was hard not to laugh at the fact that five coaster enthusiasts were standing in a park with a classic Schwarzkopf and a wood coaster, yet all that there was for us to ride was our fourth Zamperla Dragon in three days. Hopi Hari has two dark rides. Kastel di Lendas was an average clone of Disney's Small World with a small outdoor section towards the end of the course. It wasn't bad by any means, though I'd have liked it better with more lighting, as the various animatronics were quite dim in places. I was rather more impressed with the West River Hotel, a very high quality haunted house with six seater cars and atmospheric music that worked very well. None of us particularly wanted to ride the Rio Bravo rapids, so instead we wandered back over in the direction of the roller coasters. We arrived at Montezum (#1883) just as the queue opened, allowing us to get into the front car on the fourth train of the day. Maria had warned me ahead of time that this ride could be a bit on the rough side, but nothing prepared me for what was quite possibly the most unpleasant wood coaster experience I've had in my travels. It was amazing to see locals riding with their hands in the air, as there was absolutely no way I'd have tried that; the train was bouncing and shuffling so badly that I'm absolutely stunned it hasn't injured anyone yet. The only positive thing about it for me was the fact that it was the only adult-friendly wood coaster in the world I'd not ridden, which I believe makes me the first coaster enthusiast in the world to complete the full set. Nursing our bruises, we wandered across to Katapul (#1884), which began to cycle test trains twenty minutes after its posted opening time. Several of our group had ridden this in its previous guise of Thunderlooper at Alton Towers, but it was a new credit for me and a highly enjoyable one. Though not as intense as some similar rides, it was enhanced greatly by theme elements along the launch track which made it feel much faster than it actually was. It's worth commenting briefly on the boarding procedure for Katapul. Guests are not allowed into the ride station until the train has been parked, and as with most other coasters each boarding pen has an air gate. However, there are also two yellow lines painted a long way behind each gate, which guests are expected to remain behind until the gates have been opened. Those who had the audacity to step over the line (which appeared to happen on every ride cycle) were instructed by microphone to step back. Perhaps there is a sensible reason for this policy, but I'll be damned if I know what it is; why not move the air gates? We were on our way out of the park when Maria pointed out that Montezum had no queue, and asked if we'd like to ride again. Martin came up with a particularly colourful response to this which I'm not able to print on a family friendly web site such as this one, but it can be summarised in one word: no.